Edwin Velez III was charged with DUI after a crash in Hamden, Conn. His wife was charged with DUI when she showed up to pick him up, police said. Police in Hamden, Conn., charged a man and his wife with drunk driving just hours apart from each other. According to police, April Cassidy Velez, 32, drove to Hamden Police Headquarters on Saturday to bail out her husband after his DUI arrest earlier that day. She appeared intoxicated and was arrested, police said. Officers found April Velez's pickup truck parked in a snow bank in an area of the parking lot marked "Police Vehicles Only." They found empty wine bottle and empty beer cans in the truck, as well as a full six-pack of beer resting in the snow in the bed of the pickup, police said. 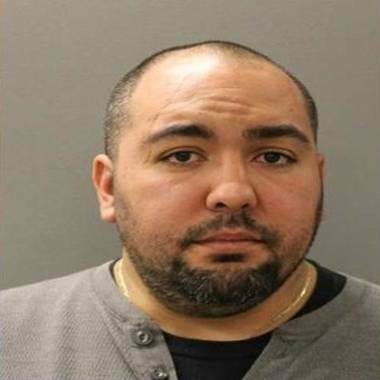 Velez's husband, Edwin Velez III, 33, was charged with drunk driving about 5:30 p.m. Saturday after police found his car crashed into a snow bank on Pine Rock Avenue. The car was empty with the engine running. Officers found Velez at his Pine Rock Avenue home a short distance away and arrested him after he failed a field sobriety test, police said. Edwin Velez, who had his wife and 5-year-old daughter in the car with him at the time of the crash, registered nearly three times the legal blood-alcohol limit. He is charged with driving while intoxicated and risk of injury to a minor. April Velez is charged with driving while intoxicated. Both were released and scheduled to appear in court Feb. 22.